A woman has been thrown to her death after a low flying plane blew her off her feet at a famed Caribbean beach. 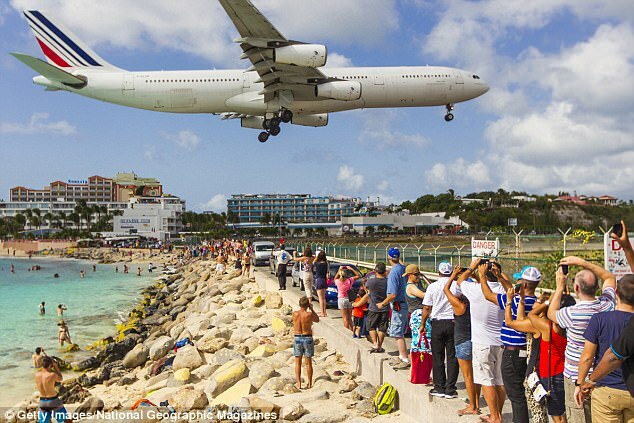 The New Zealand woman joined hundreds of other tourists at Saint Maarten to watch planes taking off at the beach – side Juliana International Airport. The woman, 57, was holding onto the fence when she was blown from her feet before hitting her head on the rocks and suffering fatal injuries. Tourists visiting the picturesque beach regularly climb up onto rocks to watch planes come into land, despite signs specifically warning against the danger. The woman is believed to have been with her family when a Boeing 737 took off for Trinidad at about 6pm, tossing her back onto the concrete. The woman suffered serious injuries after hitting her head on the concrete and was rushed to Saint Maarten Medical Center, where she died shortly afterwards. Several police patrols and paramedics had rushed to help the woman. ‘The landing and taking off of all types and size of aircrafts at the international airport of Saint Maarten is well known world wide as major tourist attraction. It went on: ‘The airport authorities and other local authorities have taken all necessary measures such as the placing of signs to warn the general public not to stand in the path of the jet blast of a departing aircraft because of the danger involved. Rolando Brison, head of tourism for the island of Saint Maarten, said he had spoken with the family of the woman, the NZ Herald reports. ‘Yes, the family did confirm that [she was a New Zealander] to me,’ Mr Brison said. ‘I met with the family of the deceased this evening and while they recognised that what they did was wrong, through the clearly visible danger signs, they regret that risk they took turned out in the worst possible way.